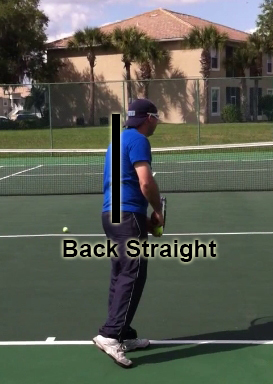 Just as with a forehand or backhand ready position, the service ready position (or as it will be called in this section the starting position) is a very integral part of the overall success of the serve. A proper starting position can increase the power of the serve, can increase the consistency of the serve and can allow a player to have a greater range of placement of the serve. The starting position for the serve (just like on groundstrokes) is the time to organize the racquet, feet and body, but because it is not necessarily under a time constraint, this time can also be used to organize the mind and relax the body. The mind can be calmed, if under a pressure situation. The mind can also be used to set up the point. Things such as what spin and where in the service box to hit the ball as well as how fast the ball will be hit can be determined and thought out before serving. Because you and not your opponent gets to decide exactly where the ball will be hit these things can be guaranteed to happen. Knowing ahead of time where and how the ball will be hit can help a player figure out how the rest of the point will play out. There are several ways the body can be relaxed all of which lead to more power and consistency. Because there is no time constraint there should be no reason a player cannot start in the right position every single time before serving. 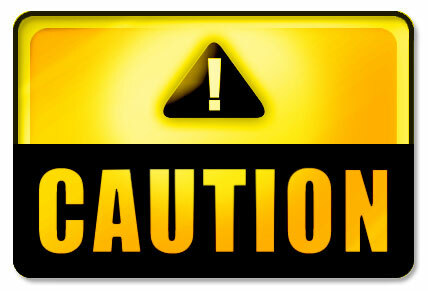 But, just like with groundstrokes, a bad starting position can make a player miss before even hitting the ball. Before even getting into the serve starting position, all good players go through a very specific routine. This routine is generally done to help relax the player as well as start to establish the rhythm of the serve. A good routine also helps keep the player “busy” which can give them less time to worry about pressure situations. Pre-serve routines vary dramatically from player to player. Some players bounce the ball with their hand. Some bounce the ball with their racquets. 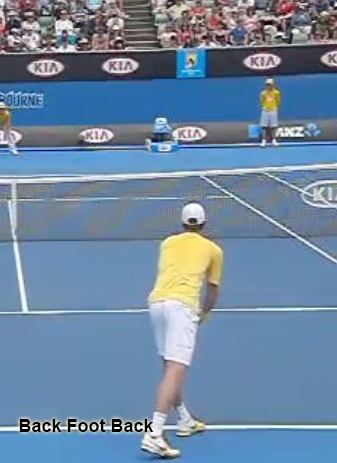 John Isner bounces the ball between his legs. Maria Sharapova straightens her hair. Many times numerous little things are done by a player before a serve. The common theme to all these pre-serve rituals is that the players consistently do them. EVERY TIME before they serve. If they have five things they do pre-serve, they always do these five things before every serve. I recommend coming up with a pre-serve routine that is easy to remember to do. And can be done the same before every single serve. 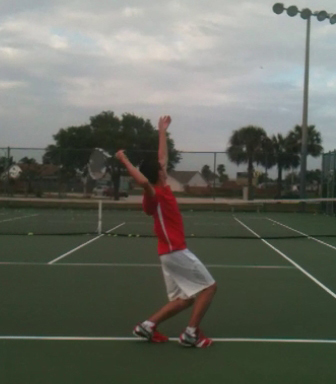 I bounce the ball Four times before every serve. Doesn’t matter if its a first serve or a second serve. 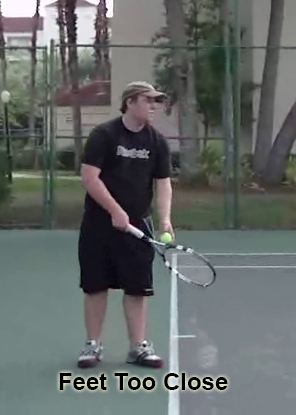 Some players will alter their routine depending on whether they are hitting a first or second serve. This is fine as long as they use the same routine for every first serve and the same for every second serve. It is important to have a routine when hitting a second serve. Many recreational players will have a first serve routine, but then just rush right into the second serve. This often times leads to a second serve that is not as successful as it would be if they went through a routine. 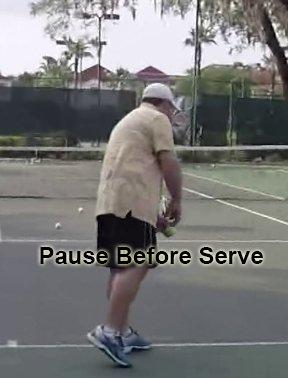 After the pre-serve routine has been performed it is very important to pause before starting the serve motion. If a player goes right into the serve without pausing there is a very good chance they will not end up keeping the racquet and body in sync with each other. I recommend taking a deep breathe in and then letting it out after doing your pre-serve routine. This gives sufficient time in-between the pre-serve routine and the actually serve. Being relaxed is one of the most important elements to a good serve. The shoulders need to be in a relaxed position. By keeping the shoulders relaxed the rest of the body has a better chance of staying relaxed. If the shoulders are too tense, there is a good chance the rest of the body will be tense. A tense body makes it really difficult to keep the swing smooth throughout the stroke. It also makes it more difficult to have a powerful serve. To help keep the shoulders from tensing up it is a good idea to just let the hitting arm and racquet hang loose. The hitting arm should be relatively straight. The shoulders should be perpendicular to the baseline. 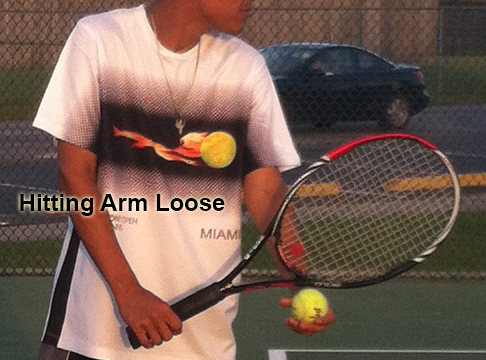 The right arm and racquet should be so loose that if the left arm was moved, the racquet and arm would just fall. 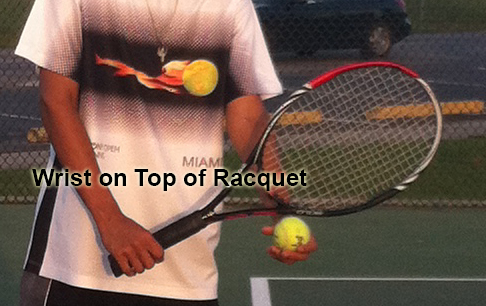 Hover over the below image to see the racquet drop. 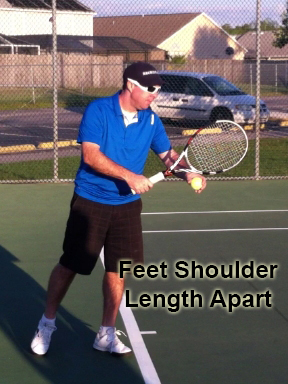 The left arm should also be relaxed, with just enough muscles being used to support the weight of the racquet. The bottom hand should be holding a continental grip while in the starting position. 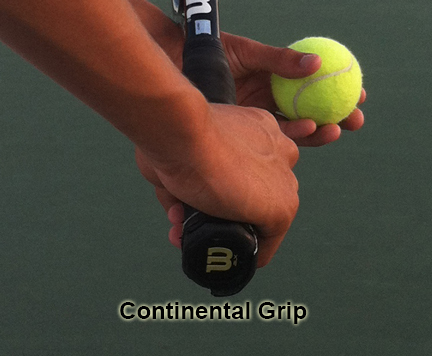 Using a continental grip gives the player options as to what kind of serve the player wants to hit. 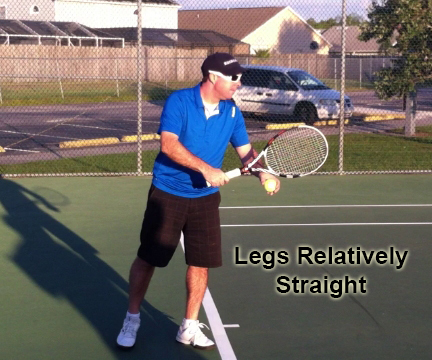 It also allows the arm to pronated which will add a tremendous amount of racquet head speed. For a greater detailed explanation on the continental service grip click here. 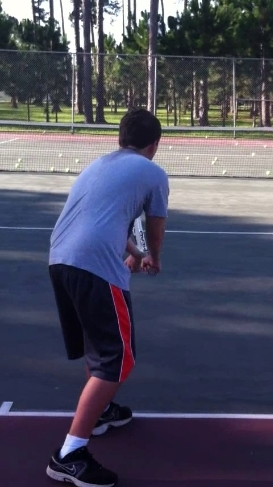 You can tell when a player uses an eastern grip because the racquet is not perpendicular to the ground. The top of the racquet will be tipped to the left. Whereas with a continental grip the racquet will be perpendicular to the ground. An eastern grip is much more comfortable and is the grip most players who have never taken lessons or just play sporadically will use. The problems with this grip are numerous. It makes it virtually impossible to hit a “real” second serve (more on that later). An eastern grip will usually force a player to bend the wrist instead of keeping it straight. This makes it very difficult to control the racquet which makes it harder to control the serve. An eastern grip also makes it so the hitting arm does not need to be pronated to hit the ball. This leads to a much less powerful serve. For more information on pronating click here. Sometimes a grip more resembling a backhand grip will be used. 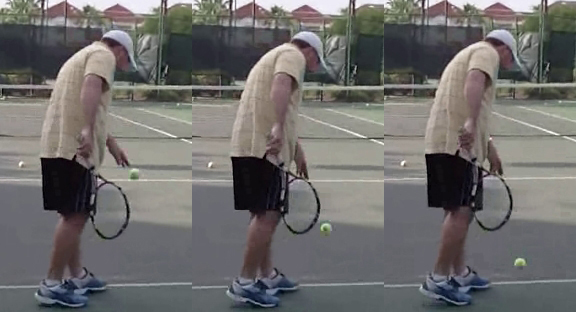 This can be used when trying to get a little more spin on the ball, just as some players will use a grip slightly towards a forehand grip when trying to hit a flat serve. The main problem with doing this is that it is really easy for an observant opponent to see the grip as been switched. 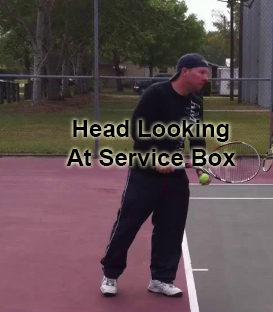 They can do this simply by looking at the racquet head. 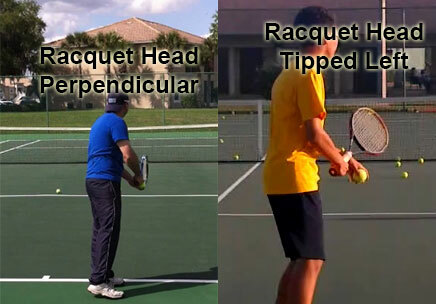 The racquet head will be tipped slightly towards the body if using a backhand grip and tipped slightly away from the body if using a grip closer to the forehand side. A word of caution on the continental grip, it can make learning to serve very difficult in the beginning. This is because the grip feels very, very uncomfortable. 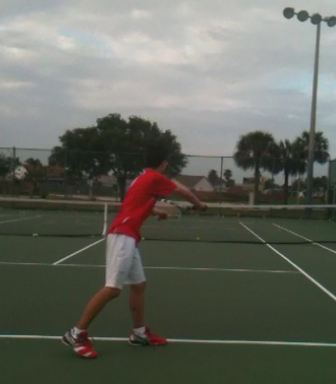 I will never forget when I made the switch from a forehand grip to a continental grip. It was the most uncomfortable thing I’ve ever done. I remember thinking I would never learn to serve with that grip. With enough practice (about a month of almost daily practice) it started to feel comfortable. 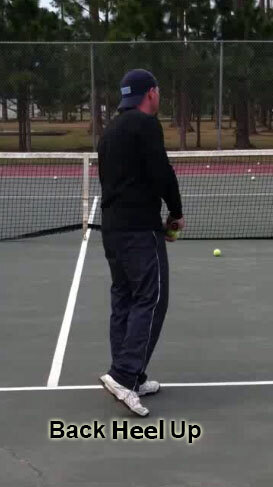 If this grip is just too uncomfortable, a grip closer to a forehand eastern grip can be used. 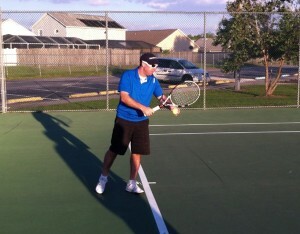 After the serve has been learned, I recommend switching to a continental grip. This can be done relatively easily by just slowly moving the grip over to a continental grip. I recommend moving it less than a quarter inch at a time and then every week moving it about the same amount closer to the continental grip until the grip is at the continental position. 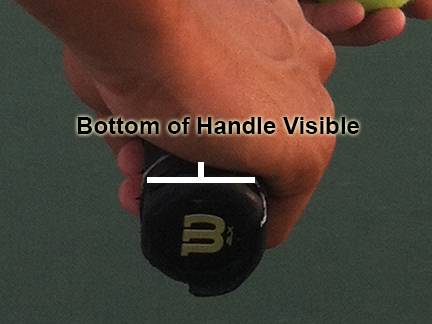 No part of the bottom hand should be off the handle, so part of the bottom of the racquet should be visible while holding the racquet. Some people will serve with the bottom of the racquet completely covered so part of the palm of their hand is not even touching the racquet. 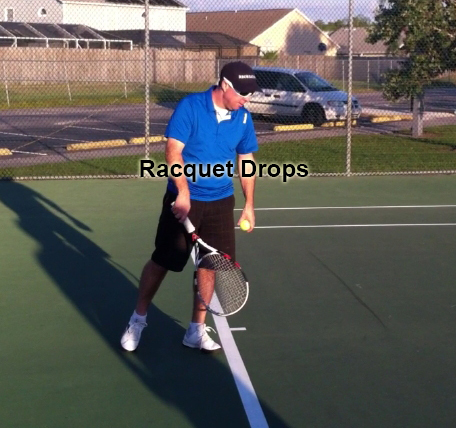 This will give a player much less control of the racquet. There may be a slight increase in power as the racquet will theoretically be longer, but the slight increase in power is not worth the loss of control. 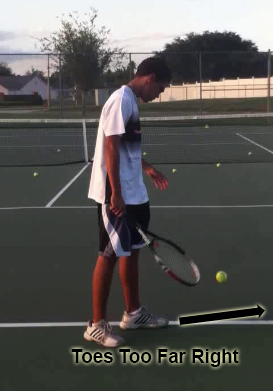 The wrist should be straight and on top of the racquet from the starting position. This can be seen well in the side view below. This should happen automatically if using a continental grip. 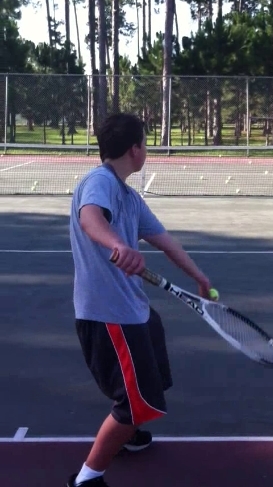 Using a straight wrist will help keep the arm stable which in turn will stabilize the racquet. 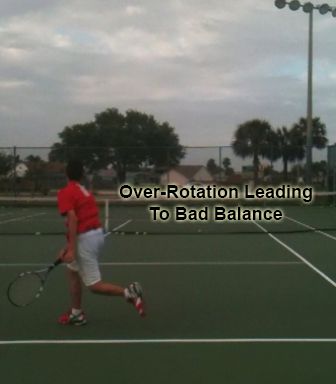 A more stabilized racquet will lead to a more consistent serve. 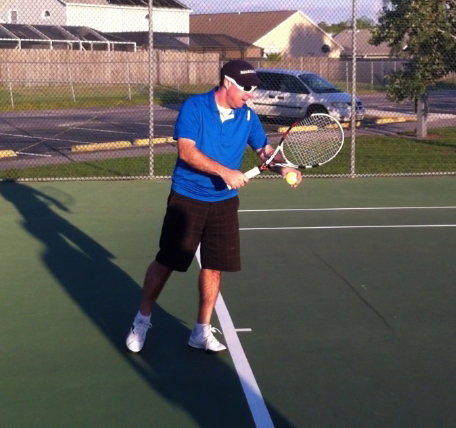 The left hand should be gripping the ball and be under the right arm and racquet. 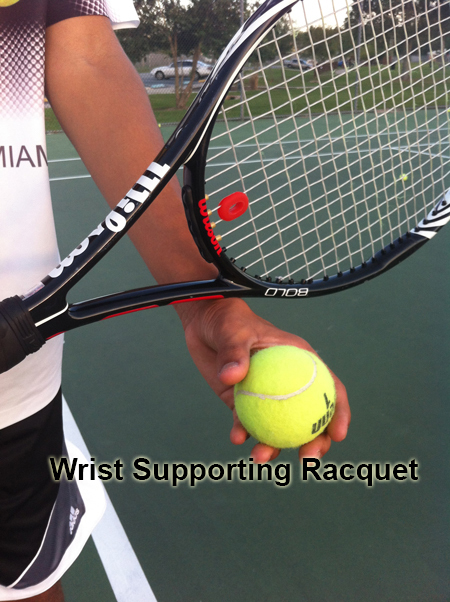 The left wrist will support the racquet and right arm. The ball should be held as if it was a cup…. This is explained in greater detail in the ball toss section located here. The racquet should be resting on the left arm. 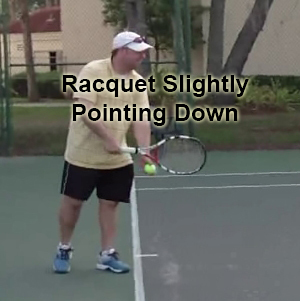 The racquet can either be pointing slightly up. Both legs should be relatively straight. Relatively straight, means their should be a slight bend to the knees, but only a slight bend. Basically the legs should be straight but the knees should not be in a locked position. Most of the weight should be on the front foot, but there should still be a little bend to the leg. The back leg should have very little weight on it. Because of this, the back foot heel should be raised off the ground. 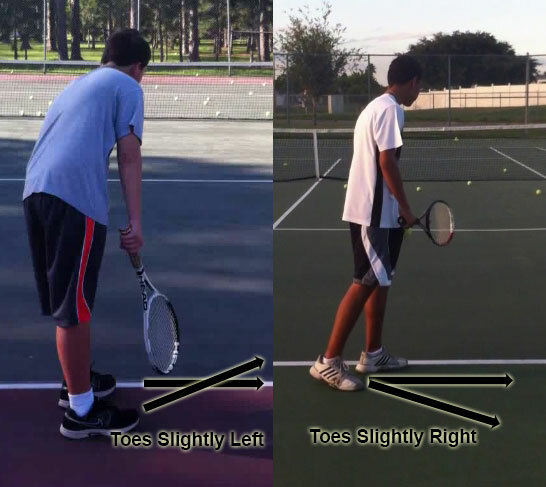 The position of the feet can dictate many factors that end up affecting the overall quality of the serve. The left foot should be pointing towards the net post. 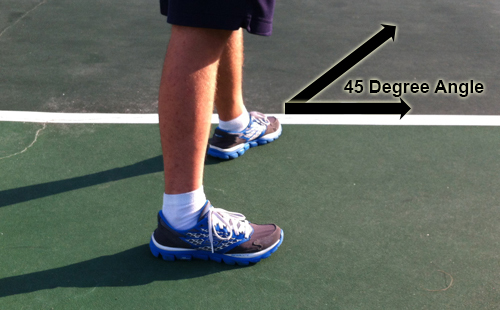 This should give the foot an angle of about 45 degrees in relation to the baseline. The front foot at a forty five degree angle allows the body to turn sufficiently at the beginning of the serve to get a good shoulder turn which adds power to the serve. 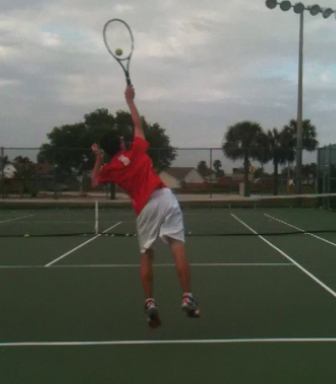 It also allows for the body to uncoil sufficiently on the forward swing of the serve. This adds power and helps the body maintain good balance. 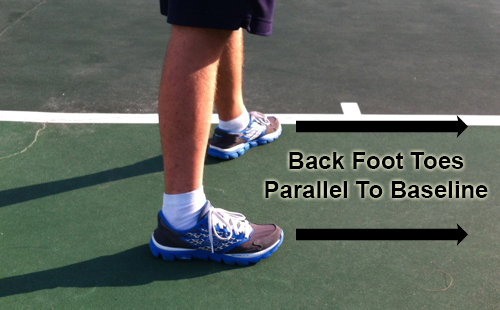 The back foot should be parallel to the baseline. The back foot toes can be slightly pointed left or right of parallel to the baseline, but they should not be too far in either direction. The back foots instep should be level with the left foots heal. Some players will keep the back foot further behind the front foot to varying degrees. This is not wrong, but I prefer the the back foots instep to be level with the front foot’s heal. The back foot being further back can make it easier to rotate the shoulders, which can give a more powerful serve. But the benefits of having the foot back are not great enough for me to recommend a player doing this. Most players who start with the back foot further to the left will bring it forward after tossing the ball. 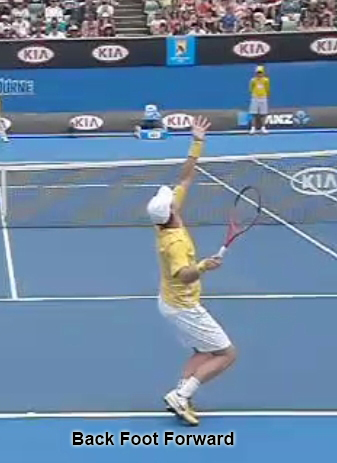 Hover over the below image of Tomas Berdych to see him do this. 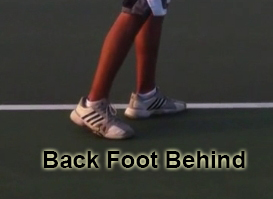 If the back foot was not brought forward, the player would have a very hard time uncoiling the body through the shot. This would lead to a tremendous loss of power. As you can see from the above images, Tomas brings his back foot up to about the start position I recommend. The key element that he does (and what makes starting with the back foot back further o.k.) is that as he brings the back leg forward, he keeps his body turned sideways. Many players who move their back foot forward on the serve will also turn their bodies too much towards the net before hitting the ball.Hover over the below image to see the back foot coming too far forward. Below is a comparison between a recreational player bringing the foot too far forward and over-rotating and Tomas. Looking at the belly button position shows the over-rotation. This over-rotation will lead to a significant loss of power as it disrupts the kinetic energy chain and a potential loss of balance. Hover over the below image to see how balance is effected by over-rotating. Moving the back foot forward is not wrong, but the benefit of a little extra shoulder rotation, which can give extra power, does not outweigh the negatives. Just moving the foot adds another element to the stroke, which means there is one more thing that can be done wrong and as with every stroke, one mistake can be the difference between an effective and an ineffective stroke. 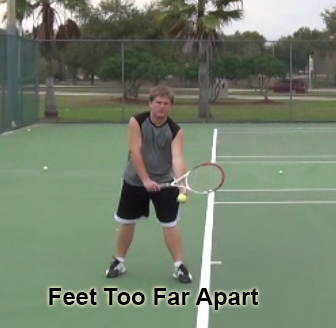 If the front toes are pointed too far to the right at the start of the serve a player may have a hard time uncoiling their bodies and can lose power. This can make it more difficult to hit the ball out wide in the deuce court or down the “T” in the ad court. This will give the returner an advantage as they will not have to cover as much of an area when returning serve. 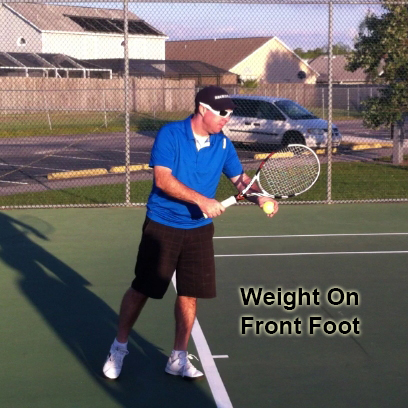 If the front toes are too far to the left they may over rotate which can lead to inconsistent serves as well as a loss of balance. The feet should be shoulder length apart or slightly more. Too far apart and the body cannot rotate sufficiently to generate power. If the feet are too close together, the player can lose balance. 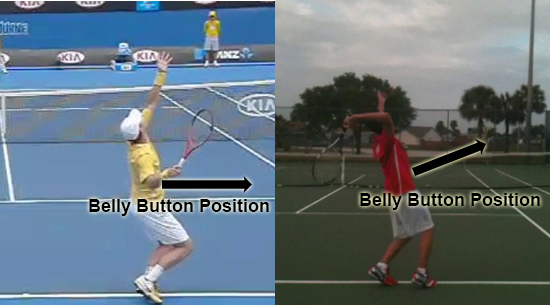 With the feet, shoulders and racquet in the right position, the belly button should be pointing towards the side fence. The back should be straight. Sometimes players will bend their back from the starting position. 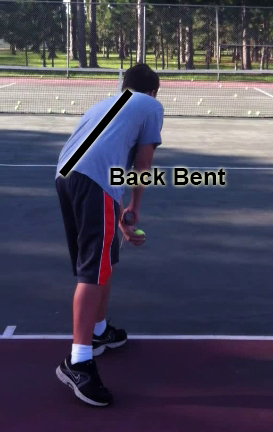 A bent back moves the players center of gravity too far forward. This can create an unbalanced body position. An unbalance body makes it difficult to have a smooth consistent swing. This can add to a dramatic decrease in power as well. Most of the time a player who bends their back will correct this during the beginning of the serve and end up with a straight back. Hover over the image to see the server straighten out their back. Since they end up with their back straight anyways, there is no reason to start with it bent. By having to straighten out the back they are adding an additional place they can make a mistake. If they don’t straighten out the back at the right time or don’t straighten it out to the same degree every time they will most likely miss the serve as any mistake can make the serve be missed. The head should be looking at the service box and over the front foot. It is important to look where you are serving. This doesn’t mean you should stare at the exact spot you want to serve, in fact most good players will be able to tell when someone is staring at the spot they want to hit the ball to. This can give them the advantage of knowing where the ball is going to be hit, before it is even hit. By knowing this they can more quickly get to the ball and hit a more effective return. I recommend scanning the entire service box. I always scan the box from right to left. Whether I am trying to serve out wide or down the “T,” I do the same scan. As I am doing my scan I try to remember in my mind the spot I want to hit to once I scan it. Before starting the service motion, make sure to think about where on the court the serve should go, what type of spin is to be put on the ball and how fast the serve is going to be hit. These elements should be thought of before every single serve. A proper starting position is a necessary step towards having a good serve. Many players pay little to no attention to their starting position and end up having a serve that is not as good as it could be.